Fighting City Hall is never easy this is just one fight of many which my friends and I have had with city hall over the last decade. This is an example of what happens when you try to fight city hall. In this letter a good friend of mine is trying to get some satisfaction and a promise that after 5 years of enduring this type of situation in our public park the practice of closing the public bathrooms and having people going to the bathroom in the bushes will be stopped. Here is his 1st letter to them in 2006. We did have the picnic that year and there were a few Johnny on the spots spread out around the park but I guess the toilette parts in every bathroom were still on back order. This fight is still going on. The park still remains open to the public and the bathrooms are very rarely opened and when they are they are filthy dirty. It would be a shame, but I think the next step is to force them to close the park as a heath hazard. I will post his continuing fight with the city until we get some satisfaction. Unfortunately if you wish to see the city’s 2nd response for him you will have to click on the picture below. Every year friends of my family hold an annual picnic in Angrinon Park in Ville Lasalle and for 5 years have had the same problem. The park is highlighted as a must go to for tourists and is used by people from all over Montreal as a meeting place for family and cultural events so could you please tell me why the toilettes are always locked with padlocks and boarded up forcing people both young and old, male and female to urinate and defecate in the woods like animals. Besides the obvious health risks; like lime ticks and unsanitary conditions I find it to be humiliating and insulting. My 80-year-old aunt had to back herself up to a tree to go to the bathroom and I wondered why do we vote for you? We have tried getting your permit to use the park and the facilities which by the way requires a $5000.00 deposit with no results. Then I remembered that you are the Mayor who when asked what you intended to do about the trucks collecting snow which were speeding and killing people, you responded on national television that the trucks had a schedule that they must keep if the streets were to be cleaned in a timely fashion and that the pedestrians would just have to be more careful and vigilant. Since when does a clean street become more important than a life? I am an eternal optimist and believe that even a politician can change and do the right thing. All we are asking for is a little respect and some dignity. Remember that we hold the power to your being in office and we are beginning to understand how the political game works. We will no longer be swayed by fancy speeches and promises at election time. I have sent you a copy of this letter and am awaiting your response. If I get none I will put this out on the World Wide Web and to the press and the people can decide what kind of man and people are running this city. 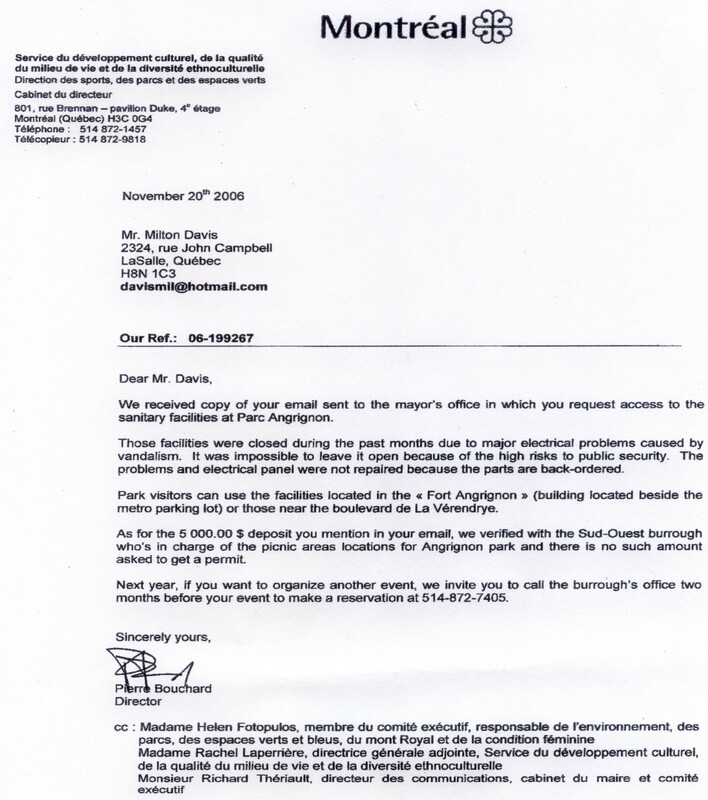 Mayor Gérald Tremblay received your email of October 3, 2006, in which you request access to the sanitary facilities at Parc Angrignon. I have forwarded a copy of your correspondence to Ms. Helen Fotopoulos, member of the Executive Committee member responsible for Parcs, for appropriate follow-up. This entry was posted in abuse of power, Beat Cops, Canada, Charitable Organizations, Crime On The Rise, drugs, drugs and children, Free Community Services, Government, Hydro Quebec, Juvenile Delinquency, Montreal Police, Moving, Prejudice, Schools and Learning Places, Security and Public Transit, stereotyping, The Church, The work force, Things to do in Montreal for free, Uncategorized, Walking parks, what is wrong with public transit and tagged Bathroom, Business and Economy, facillities, fighting city hall, Gérald Tremblay, Mayor, Montreal, Park, park up keep, parks, politics, unsanitary toileete, World Wide Web. Bookmark the permalink.